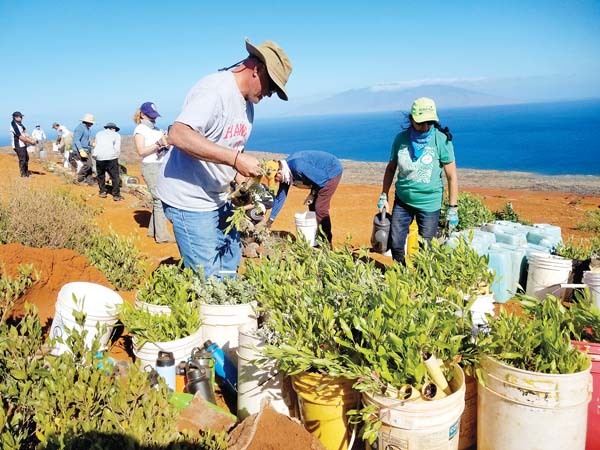 The Maui Nui Makai Network, a grass-roots coalition of community groups that have come together to protect and restore the islands’ coral reefs and nearshore marine resources, received The Nature Conservancy’s Kako’o ‘Aina Award at a community celebration on Maui recently. Each awardee was given an ‘o’o, or Hawaiian digging stick, made of koa wood, made by Maui artist Calisto Palos. The ‘o’o is a traditional Hawaiian farming tool used for turning over soil, digging deep holes, planting and more. Accepting the awards on behalf of the seven groups were Leimamo Lind-Strauss, Kipahulu ‘Ohana in East Maui; Uncle Mac Poepoe, Hui Malama O Mo’omomi on Molokai; Sol Kaho’ohalahala, Maunalei Ahupua’a on Lanai; Scott Crawford, Na Mamo O Mu’olea in East Maui; Ekolu Lindsey, Polanui Hiu in West Maui; Jay Carpio, Wailuku Ahupua’a in Central Maui; and Robin Newbold, chairwoman of the Maui Nui Marine Resources Council.